Does the Data Governance performance meet the customer’s requirements? What type of data governance is right for your organization? What can happen without data governance? Has the Data Governance work been fairly and/or equitably divided and delegated among team members who are qualified and capable to perform the work? Has everyone contributed? Why have a data governance plan? For more than twenty years, The Art of Service's Self-Assessments empower people who can do just that - whether their title is marketer, entrepreneur, manager, salesperson, consultant, business process manager, executive assistant, IT Manager, CIO etc... - they are the people who rule the future. They are people who watch the process as it happens, and ask the right questions to make the process work better. This book is for managers, advisors, consultants, specialists, professionals and anyone interested in Data Governance assessment. Featuring 582 new and updated case-based questions, divided into seven core areas of process design, this Self-Assessment will help you identify areas in which Data Governance improvements can be made. Using a Self-Assessment tool known as the Data Governance Index, you will develop a clear picture of which Data Governance areas need attention. 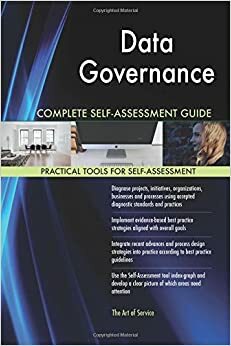 Included with your purchase of the book is the Data Governance Self-Assessment downloadable resource, containing all questions and Self-Assessment areas of this book. This enables ease of (re-)use and enables you to import the questions in your preferred management tool. Access instructions can be found in the book.